Silver,Blaze,Tikal,and Jet. . Wallpaper and background images in the Sonic the Hedgehog club tagged: photo silver blaze tikal and jet. This Sonic the Hedgehog photo might contain cavolo rosso. Why does everyone think that the hedgehogs are gonna dannah... Shadow isn't wearing one. Sonic is wearing an dannah, not a scarf. 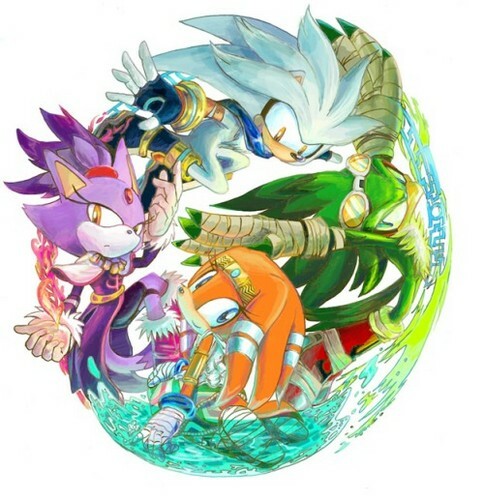 Shadow isn't wearing a dannah, so why is Silver? Ask the artist who drew it, I don't know the artist name. And did you meant Bandanna instead of dannah? You confused me with that word ''dannah''.